Info "Inflate the balloon and send it flying!" 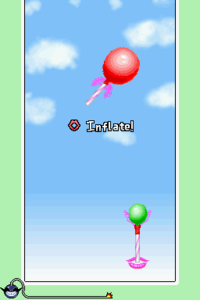 Rising Inflation is a microgame found in WarioWare: Touched! in the Mic Rocking stage. The game's goal is to blow into the mic to inflate the balloon. 1st level difficulty: One balloon must be inflated. 2nd level difficulty: Two balloons must be inflated. 3rd level difficulty: Three balloons must be inflated.